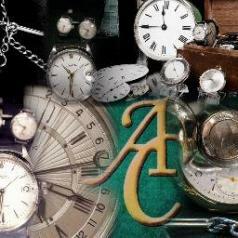 ANDREW PAGE who is the head of our Company, is a member of the British Horological Institute, and the Company is based in Hertfordshire close to the A1 in the pleasant village of Little Wymondley, near Hitchin. Here are based our workshops and our showroom which houses a large selection of time pieces ranging from eighteenth century Longcase clocks to twentieth century Rolex watches. We have free car parking available and the showroom is open to the public to browse and buy from our comprehensive collection of pocket watches, wrist watches, clocks and barometers. 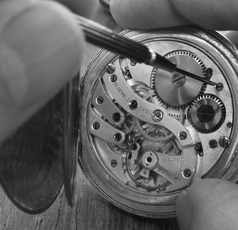 Our core business is the repair and restoration of clocks and watches and we pride ourselves on the quality of workmanship and customer service. Our workshop team have the facilities and expertise to repair your treasured item and our completed work and servicing is covered by a one year guarantee. We are happy to provide a free, no obligation estimate for any proposed work to be undertaken. This allows you to choose how you wish to proceed, from a simple battery replacement and waterproofing, to the full servicing of your prized possession. In addition, we are very pleased and proud to announce that we have recently been appointed the UK Service Centre for two Swiss watch manufacturers - the EDOX and the CLAUDE BERNARD watch companies.